Gypsy Scholar: Author Shin Kyung-sook: "meaning . . . lost or misconstrued"? Your wife's accurate translation is not blatantly chauvinist like the Joongang version, but I wonder how Shin Kyung-sook would be able to make that judgment. 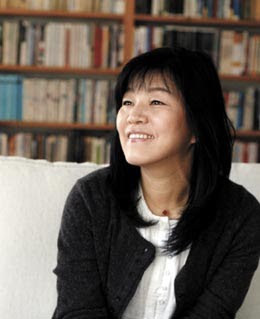 As a Korean author, she knows how to bring out the beauty of the Korean language, but so do authors of other languages. I've learned two European and three Asian languages in addition to my native language of English. I've read original literature in all of them, and I would have a hard time evaluating each language on its suitability as a literary language. I love each language for what it is - I really do! Colorful and creative names of Chinese dishes make Chinese menus literary masterpieces. I love the simplicity of Chinese, exemplified in the thousands of 4-character proverbs, many of which have been adopted into the Korean language. I love the way Japanese and Spanish CVCVCVC syllable patterns roll off the tongue. German feels heavy and sturdy like a steel-girder frame. Among the languages I've learned, German is my least favorite but that's just my opinion and not based on any objective analysis. Americans are a proud people, but my fellow Americans generally do not boast about English. Koreans, Japanese, Chinese, and Spanish speakers, on the other hand, often state the opinion that their language is beautiful and expressive. Perhaps these languages really are so beautiful and expressive that native speakers can't help but gush about them or perhaps children from countries where these languages are widely spoken develop pride in their languages through the school curriculum, TV programs, and conversations with adults. Anytime most or nearly members of a group share an opinion, I'm inclined to think that the opinion was formed more through verbal interaction than through experience and reflection. I agree with you, Sonagi. Even Shin Kyung-sook's more measured meaning in the original Korean would be a difficult opinion to justify. How would one go about grounding such an opinion? What are the criteria? I think that the topic is so complex that people ought to avoid boasting of how beautiful their native language is. Bilingual individuals might be able to speak of preferences for one language or the other, but they, too, ought to acknowledge subjectivity. I sent the JoongAng reporter an email on this point but have heard nothing so far. Something else just occurred to me. Literature is one field in which Korean women have excelled for what they can do, rather than how they look, fitting, I suppose, given the historical signficance of The Memoirs of Lady Haegyeong as the first major work of literature written in Hangeul and by a woman. That's why I use a different image than my own for profile -- to avoid prejudicing blog readers against me on the basis of my appearance. Not that I'm female . . .